Read to handle it all. We're here to listen and help solve your particular needs. That includes time-saving strategies and tips designed just for administrative professionals. Meet [email protected], our once-monthly roundup of helpful articles and tips specially curated for office administration professionals like you. Tips and real-world advice from your peers all over the country. Go team! A quick-hit workplace tip you can use right away. May be even on the spot. A short, sweet read on a topic we know you can relate to. 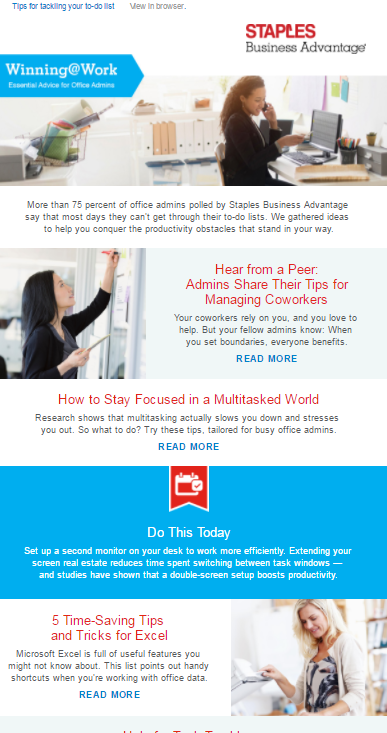 Are you currently a Staples Business Advantage customer?